Judi is a contributing author to the Cybercrime Investigation Body of Knowledge (author of Chapter One: CyberCrime and Its Investigation), and appointed member of the CIBOK editorial committee. Judi gave a “Cybersecurity Expert Briefing” for CEOs, addressing threats, risk management and best practices for cybersecurity governance, including necessary proactive measures and incident response. Judi addressed cybersecurity diligence issues for mergers and acquisitions on a panel with John Hauser, EY, and Joanna Fields, Aplomb Strategies Inc.; Daniel Perez, Donnelley Financial Solutions, moderated. Judi discussed cybersecurity governance and risk management, including cyber insurance, regulatory and civil liability issues, and evolving technological threats, with Mark Sutton, VP-CISO, Bain Capital, and Shannon Groeber, SVP, JLT Specialty USA Cyber/E&O. LTC Reid Sawyer, US Army (Ret. ), SVP, JLT Specialty USA, moderated. Judi served on a panel with Patricia Lizarraga, Managing Partner, Hypatia Capital, Independent Director, Credicorp, Ltd.; Gant Redmon, IBM Resilient; and Gary Steele, CEO, Proofpoint, Inc. Tracy Byrnes, Chief Correspondent, TheStreet, Inc., moderated. Judi served on the “Cybersecurity and Boards” panel with Leonard Bailey of the U.S. DOJ; and Peter E. Murphy, CEO of Wentworth Capital Management and corporate director of Tribune Media, Malibu Boats and The Stars Group; Katherine Mooney Carroll of Cleary Gottlieb moderated. Judi spoke on a panel with Timothy Ryan, EY, and Matthew Waxman, Columbia Law School. Jesse Greene, Jr., Board Member, Caterpillar Inc., and Senior Fellow, Richman Center, moderated. Judi discussed cybersecurity regulation on a panel with moderator Micaela McMurrough, Covington; Michael McGowan, Stoz Friedberg; and Hilary Bonaccorsi, Dechert. Judi served on a panel with Richard Jacobs, ASAC-Cyber, FBI-NY; Ed Stroz, Founder and Co-President, Stroz Friedberg; and Josh Koplik, CISO, IAC. Judi discussed cybersecurity regulation on a panel with Nicollette Martin, Citi, and Craig Newman, PBW&T; Tom Brown, BRG moderated. Judi served on a panel discussing FinTech’s cybersecurity concerns with Justin Fier, Darktrace; Jon Hawes, Panaseer; and Ed Dickson, MSA Security. Rob Sloan, WSJ Pro, moderated. ​Judi spoke at the U.S. Chamber of Commerce for the book release of the Cybercrime Investigation Body of Knowledge (CIBOK). Judi is a contributing author to the CIBOK (Chapter on CyberCrime and Its Investigation) and a member of the CIBOK editorial committee​. Judi participated on a panel ​regarding Privacy law and policy ​with former FTC commissioner Julie Brill​;​ Viacom ​SVP, ​Chief Privacy ​Counsel, Pauline Wen​; and Pfizer Corporate Counsel, Global Privacy, Joanna Levin. Judi convened national cybersecurity leaders from government, industry and academia, and facilitated a full-day closed​-door​ session, on bipartisan solutions to cybersecurity regulation and enforcement. Judi gave a CLE lecture, along with Bryan Gorczyk of Renaissance Associates, on ethical obligations and practice tips involving metadata in electronic documents, including in light of the Supreme Court of New Jersey’s recent rules and guidance. 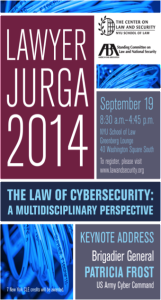 Judi served on a panel discussing cybersecurity ethics, governance, and risk. Judi served on a panel discussing ethical considerations, as well as repetitional and logistical risks, regarding collecting and using personal information, and opportunities in data analysis for legal and business decision making. Judi was joined by fellow panelists Rachel Barnett, General Counsel, Travelzoo, Justin Castillo, Head of Legal, BT Americas, and Jan Van Hoecke, CTO, RAVN-UK, and moderator Harriet Pearson, Partner, Hogan Lovells. Judi served on a panel providing an executive cybersecurity briefing and practice tips to corporate general counsels. Judi participated in a panel on the board’s role in overseeing cybersecurity preparedness; developing case law; incident response and disclosure and governance considerations raised by cybersecurity incidents, along with Luke Dembosky, Debevoise & Plimpton; David Fagan, Covington & Burling; and N. MacDonnell Ulsch, PwC Advisory Services. Judith participated in a panel discussion with Lawrence Byrne, Deputy Commissioner, Legal Matters, New York City Police Department, Saritha Komatireddy, Assistant United States Attorney for the Eastern District of New York, and Alexander Southwell, Partner and Co-Chair, Privacy, Cybersecurity, and Consumer Protection Practice Group, Gibson Dunn & Crutcher. 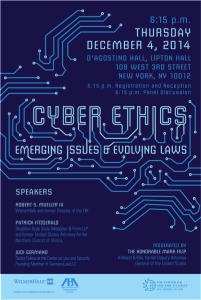 The discussion, moderated by Ann Prunty, Assistant Deputy Commissioner, Legal Matters, New York City Police Department, will explore how electronic data is protected through encryption, the efforts of law enforcement to access encrypted data in criminal investigations and efforts of technology companies to protect encrypted data and the security of their technology. Judi delivered a 90-minute lecture on Cybersecurity Law & Corporate Governance Issues. Judi was a featured guest discussing cybersecurity issues and strategies for small businesses, along with Vikas Bhatia of Kalki Consulting, and host Carol Roth, author of The Entrepreneur Equation. 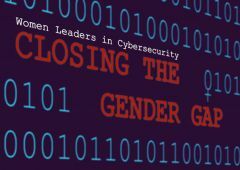 Judi coordinated, hosted and delivered a keynote address at this full-day conference, with more than 450 registrants, focusing on opportunities for women at entry, mid-career and senior level positions in cybersecurity, and discussing interdisciplinary approaches to cybersecurity and coordinating regulatory oversight. 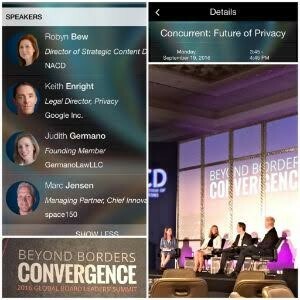 Judith spoke on the future of privacy with Keith Enright, Legal Director, Privacy, Google Inc. and Marc Jenson, Managing Partner, Chief Innovation Officer of space150. Judith spoke on cybersecurity risk oversight as a board fiduciary duty, along with David Glockner, SEC Regional Director, and Mary Beth Vitale, Board Member, CoBiz Financial Inc and Board Member, Zynex Inc.
Judith participated in a roundtable discussion moderated by Danielle Gray, O’Melveny (former Assistant and Cabinet Secretary to United States President Obama), and Liz Mann, EY. Judith moderated a panel regarding the role of the private sector in internet security and cyberstatecraft, with Dmitri Alperovitch, Co-Founder and Chief Technology Officer, CrowdStrike Inc.; Cheri McGuire, Vice President, Global Government Affairs & Cybersecurity Policy, Symantec; Christopher Painter, Cybercoordinator, U.S. State Department; and Adam Segal, Maurice R. Greenberg Senior Fellow for China Studies and Director, Digital and Cyberspace Policy Program, Council on Foreign Relations. Judith spoke regarding advancing and improving self-regulatory approaches to cybersecurity. Judith participated in a fireside chat with Alex Stamos, Chief Security Officer of Facebook. Judi served on a panel with Bob West, the Managing Director of Care Works Tech and Former Bank Chief Information Security Officer, moderated by Steven Katz, Board Director and President of Steven Katz & Associates, Inc.
​Judith addressed the FBI Financial Cyber Crimes Working Group, NY, along with Freddy Dezure, head of the European Union’s Computer Emergency Response Team (“CERT-EU”) and Roland Cloutier, VP and CSO of ADP. Judi delivered opening comments at a symposium moderated by Preet Bharara, and sponsored by NYU Center on Law & Security and U.S. Attorney’s Office for the Southern District of NY. 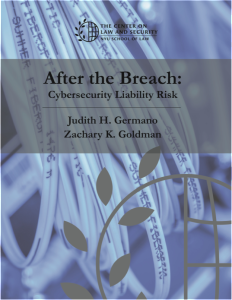 Judi served on a panel discussing third-party cyber risk presented at the University Club. Judith served on a panel with Laureen Seeger, General Counsel of American Express, and Eric Friedberg, cofounder of StrozFriedberg. Michael Fricklas, General Counsel of Viacom, moderated the panel. Judith served on a panel discussing cybersecurity challenges for the private sector with Richard Bejtlich, Chief Security Strategist, FireEye, Ellen Richey, Vice Chairman, Risk and Public Policy, and Visa Inc. Cecilia Kang, National Staff Writer for Media, Entertainment and Technology, The Washington Post, moderated the panel. Judith served on a panel discussing cybersecurity and board oversight with Joel Molinoff, Former Assistant Director of the President’s Intelligence Advisory Board, Chief Information Security Officer, CBS Corporation. Austin P. Berglas, Former Assistant Special Agent in Charge of FBI’s Cyber Branch in NY, Current Senior Managing Director K2 Intelligence, moderated the panel. Judith spoke on women in tech, law and leadership. 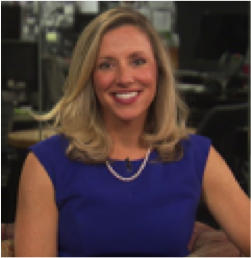 Judith Germano appeared on HuffPostLive regarding “Hacking the Glass Ceiling,” helping to get more women and girls into cybersecurity. Judith hosted this full-day (sold out!) 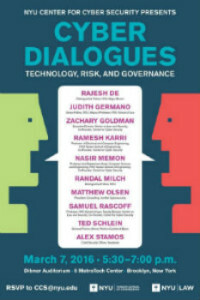 conference at NYU School of Engineering. Sponsored by IBM, Intel, Goldman Sachs, ISIS and SANS. Judith delivered the keynote address regarding critical business issues where privacy and security intersect. Judith moderated a panel discussion with Nate Jones, Microsoft, James Garland, Covington &Burling, Michael Price, Brennan Center for Justice, Kate Westmoreland, Center for Internet and Society, Stanford Law School, and Mick Stawasz, the Deputy Chief for Computer Crime, Department of Justice. Georgetown Law, Cybersecurity Law Institute, Washington, D.C.
Judith served on a panel with Michael A. Aisenberg, Principal, Cyber Policy Counsel, The MITRE Corporation, Timothy P. Ryan, Cybersecurity and Investigations Practice, Kroll Associates, Inc. moderated by Luke Dembosky, Deputy Assistant Attorney General, U.S. Department of Justice. Judith moderated a panel discussion with Joseph V. DeMarco, Partner, DeVore & DeMarco LLP, Tom Finan, Senior Cybersecurity Strategist and Counsel, Cameron R. Kerry, Distinguished Visiting Fellow, and Randal S. Milch, Executive Vice President, Strategic Policy Advisor to Chairman and CEO, Verizon. Judith served on a panel with Moira Kilcoyne, Co-Head of Global Technology and Data at Morgan Stanley, and Allison Wikoff, Intelligence Analyst/Security Researcher at Dell SecureWorks moderated by Melody Hildebrandt, Global Head of Cybersecurity at Palantir. Judith served on a panel with Former FBI Director Robert Mueller, Former U.S. Attorney Patrick Fitzgerald, moderated by the Former Acting U.S. Attorney General Mark Filip. 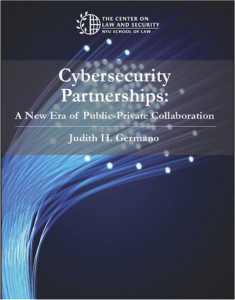 Judith delivered the Keynote address regarding the importance of, and how to improve, effective internal communication and coordination among senior corporate executives and board members on cybersecurity issues, and matters of public-private collaboration. Judith moderated a panel discussion on “Cybersecurity and the Private Sector” with Leonard Bailey, U.S. Department of Justice, Randal Milch, General Counsel, Verizon Communications, Daniel Weitzner, Massachusetts Institute of Technology, and Michael Vatis, Steptoe & Johnson.